Bernadette Hromin has been a practicing ophthalmologist in the New York area for more than 10 years. Having a professional fluency in Spanish, she writes a blog which educates health care workers in the bilingual clinical environment. As an eye doctor, Bernadette is a stickler about eating one green vegetable daily. Waking up with a swollen eyelid can be alarming and uncomfortable, but home remedies and doctor-recommended treatments typically resolve this problem within a matter of days. This swelling may be caused by a variety of factors, including crying, trauma, insect bites, allergy, irritation, infection, or blocked oil glands. Less commonly, puffy eyelids are related to thyroid disease or disorders that cause generalized swelling, such as liver, kidney or heart disease. Rarely, the swelling is a sign of a life-threatening infection or eye cancer. If your eyelid is swollen due to an obvious cause, such as a mosquito bite, crying, or minor trauma, try a cool compress. For other potential causes, check below to match up your symptoms with a more effective treatment. If you have a swollen eyelid, a cool or warm compress often improves symptoms. Applying a cool compress can help if the swelling is related to irritation, recent trauma or localized allergy, while a warm or hot compress improves blood flow to the area and reduces swelling caused by an infected hair follicle or blocked oil glands. Wash hands thoroughly to avoid the spread of infection. Fold a clean washcloth into quarters. Fill a small bowl with warm or cool water. Be careful to avoid water that is too cold or too hot, as this can harm the skin. Submerge the washcloth in the water, then squeeze out most of the excess. Gently place the washcloth over the swollen eyelid, keeping your eye closed. Hold in place for 5 to 10 minutes, and repeat several times daily. Launder the washcloth in hot water after use, to prevent the spread of infection. Try not to rub your eyes, as this may make your symptoms worse. Avoid applying lotion or other cosmetics near the swollen eyelid. Don't wear contact lenses until the swelling goes away. Stop using any new products that could be contributing to your symptoms, such as facial tissues, makeup, lotion, shampoo, eye drops or contact lens solution. Try lubricant eye drops or artificial tears to counter eye dryness. These drops may also help rinse irritating substances from the eye. If you have allergies, over-the-counter allergy drops may also improve symptoms. If these home treatments do not provide relief after a day or two, talk to your doctor. Also, if your swelling is accompanied by pain, fever, vision abnormalities or abnormal bulging of your eye, see your doctor right away. A swollen eyelid is a symptom, so it's important to identify the cause in order to effectively treat this problem. Read on to learn about situations or conditions that can lead to eyelid swelling. Allergic reactions are the most common cause of eyelid swelling. Cosmetics, facial tissues, eye drops or other substances that come in contact with the eye or eyelid skin may cause localized reactions that include swelling. Widespread or systemic allergic reactions can also lead to puffy eyelids. Allergies to dust mites or pollen, for example, may trigger an array of respiratory, skin and eye symptoms, including swollen eyelids. Severe food and medication allergies may also cause angioedema, which is deep tissue swelling that usually affects the face, lips or tongue — although it cal also cause swollen eyelids. 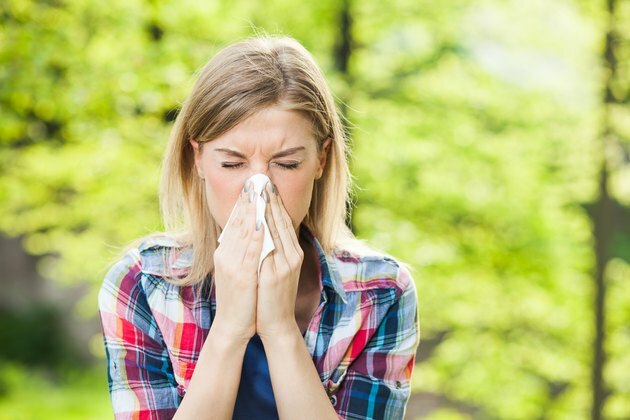 TREATMENT FOR ALLERGIES: For localized or mild reactions, remove or stop using the suspected allergen, and follow your doctor's treatment recommendations, which may include antihistamine eye drops or pills, steroid eye drops or allergy medications. For severe allergy symptoms, including angioedema, severe hives and swelling or impaired breathing, seek immediate medical attention. Conjunctivitis, a common eye infection also called "pink eye," can be a very contagious infection that occurs in one or both eyes. Viral conjunctivitis leads to red, burning eyes with a watery discharge, while bacterial conjunctivitis is characterized by red, swollen eyes with sticky pus. Red, burning eyes and puffy eyelids can also be caused by allergies or irritants, such as smoke or pollution, although allergic and irritant conjunctivitis are not contagious. TREATMENT FOR CONJUNCTIVITIS: Symptoms of conjunctivitis are usually relieved by using a warm or cool compress. Viral conjunctivitis should go away on its own, however consult your doctor if you suspect you have bacterial conjunctivitis, as antibiotic eye drops may be indicated. Allergic conjunctivitis can usually be managed with saline or antihistamine eye drops, and any conjunctivitis related to irritants should improve once the cause is removed. A stye, or hordeolum, is an infection of an eyelash hair follicle. A classic sign of a stye, which is usually caused by the staphylococcus bacteria, is a tender, red, pimple-like lump on the edge of the eyelid. Most styes cause a small section of the eyelid to swell, but sometimes the infection spreads and leads to swelling of the entire eyelid. TREATMENT FOR A STYE: A hot compress is usually the only treatment needed, as the heat helps the stye come to a head, so it ruptures and drains. Most styes resolve in a few days. If the stye does not drain on its own, see your doctor. Infrequently, treatment with antibiotics is needed. A chalazion looks similar to a stye, but is not an infection. Instead, this eyelid lump or cyst, and the related swelling and inflammation, is caused by a blockage of oil glands in the eyelid. TREATMENT FOR A CHALAZION: Without any treatment, this inflammation and swelling can take several weeks to heal. Like treatment for a stye, warm or hot compresses can be an effective way to speed healing. If the chalazion remains after 8 weeks, or if it is painful or causes vision changes, see your doctor. Swelling of the eyelids may be related to blepharitis, which is a chronic inflammation of the eyelids. 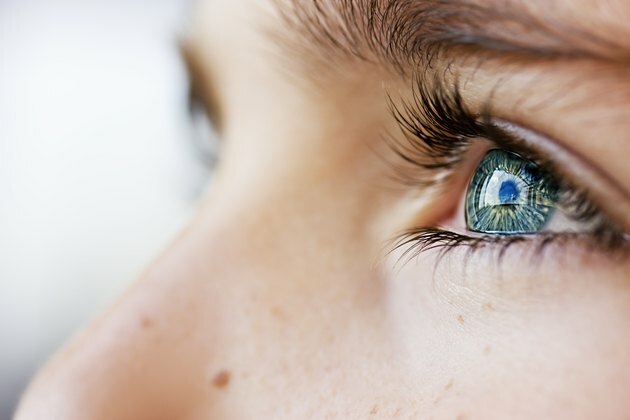 It usually affects the area where the eyelashes grow, and commonly impacts both eyes. Most cases of blepharitis are caused by bacterial infections, skin conditions or oil gland dysfunction. Symptoms include dry eyes, and red, itchy and swollen eyelids that can appear crusted and greasy. TREATMENT FOR BLEPHARITIS: Eyelid hygiene is an essential part of treatment. In addition, warm compresses and gentle eyelid massage help release the clogged oil. If you suspect you have this condition, work with your doctor to manage any underlying conditions or infections, which may include the use of antibiotic or steroid eye drops. People with recurrent blepharitis are often referred to an ophthalmologist for ongoing care. An infection in the tear ducts can also lead to swelling of the lower, inner eyelid. Also called dacryocystitis, this infection is often caused by a blockage of the tear duct, and can lead to pain, redness, excessive tearing and pus discharge. It can occur at any age, but this infection is most common in infants. TREATMENT FOR AN INFECTED TEAR DUCT: Applying a warm compress several times daily can help with drainage and pain, and infants who have an obstructed tear duct may benefit from a gentle massage of the tear duct area. A doctor should be consulted if this infection is suspected, as antibiotic therapy may be necessary, and sometimes surgery is required in order to bypass the blockage. Other infections can less commonly lead to eyelid swelling, including herpes of the eye, shingles that affects the eye area, or eyelid cellulitis, which is a bacterial infection of the eyelid skin. Rarely, eyelid swelling is caused by orbital cellulitis, an infection of the eye socket, or cavernous sinus thrombosis, a blockage of a vein caused by an infected blood clot. These infections can be life threatening, so prompt medical evaluation and treatment is essential when eye swelling is accompanied by fever, bulging eyes, impaired eye movement or any loss of vision. TREATMENT FOR OTHER INFECTIONS: Infections of the eye or surrounding tissue require a medical evaluation. Treatment is directed at the cause, and may involve antiviral agents, oral or intravenous antibiotics, and in some cases, surgical drainage. Systemic disorders, or conditions that affect more than one body system, can cause generalized swelling, or edema. Severe thyroid disease, kidney or liver disease, congestive heart failure and superior vena cava syndrome, a blockage or compression of the major vein in the body, are examples of disorders that lead to swelling in many areas of the body, including the eyelids. TREATMENT FOR SYSTEMIC CAUSES: Treatment of generalized edema is aimed at managing the underlying cause. If you have widespread swelling, see your doctor for evaluation and treatment. If home treatment is indicated, but the swelling is not getting better after 1 to 2 days, speak with your doctor. If you also have pain, pus-like drainage, or a rash, see your doctor. Seek urgent medical attention if you experience eyelid swelling that worsens rapidly, if you have bulging of one or both eyes, or if your eye swelling is accompanied by a fever, significant pain, or vision problems. 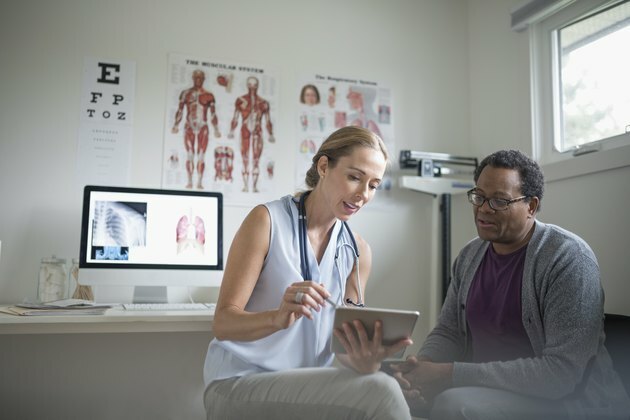 If you suspect you have allergies, work with your doctor on a management plan, so you can understand which products or substances you need to avoid. Products that are fragrance or preservative free, or hypoallergenic, may work better if you have allergies or sensitivities to healthy and beauty products. If you wear contact lenses, follow the recommended procedures for length of wear, and for cleaning, disinfecting and lens replacement. Take steps to treat facial infections early, so they don't spread to the eyes. Prevent infection by washing your hands regularly, keeping your fingers out of your eyes, and not sharing pillowcases or bedding with anyone who has an eye infection. Avoid injury to your eye, which can lead to swelling. Wear protective eye gear when engaging in sports that risk eye injury, or if working in conditions where debris or objects could harm the eye. Work with your doctor or dermatologist to effectively manage any skin condition, to avoid this problem spreading to the eye area. If you have any medical conditions that cause edema, follow your doctor's recommendations so these conditions are well managed. American Academy of Ophthalmology: Conjunctivitis: What Is Pink Eye?